The combatants in last season’s Stanley Cup Final met a week into this young season and the rematch looked like a mismatch. 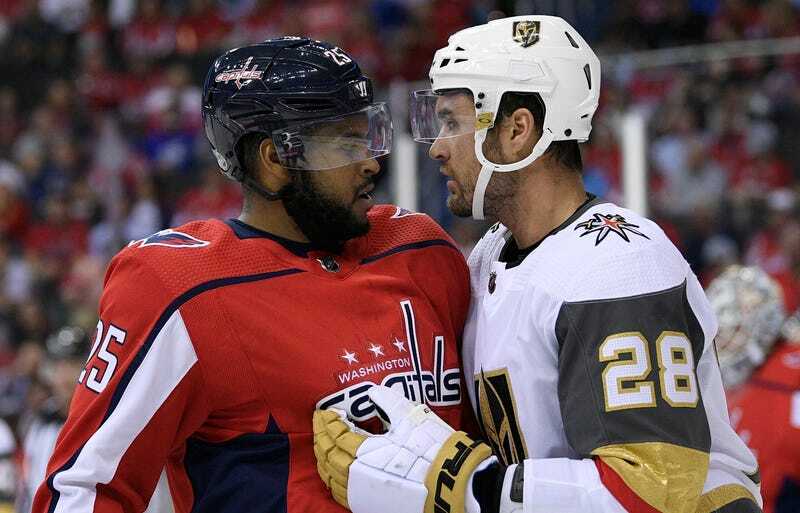 The Capitals rode their hot offensive start to a 5-2 victory over the Golden Knights, who now have a 3-4-0 record that has commentators revving up their “I told you they were a fluke” takes. On the other side, it sure looks like Washington (3-2-1) remains one of the teams to beat in the East. It’s early, but what can we expect in the way of encores from the reigning conference champs? Journalistic tradition obligates me to refer to hockey fans as “passionate,” which is an endearing way of saying that no group of people on Earth can overreact more vehemently to small sample sizes. In the meat grinder of the Western Conference, though, Vegas will feel every one of these early-season losses during the final scramble for playoff spots in the spring. And the Knights, to be frank, look like a team that spent the offseason not addressing their gaping roster holes on defense, and following up an incredible expansion draft with some very questionable trades. Scanning a roster to see that Shea Theodore is the best active defenseman is like looking at Trump’s cabinet and realizing Rick Perry is the smart one. Meanwhile, Washington’s offseason went about as well as a salary cap–era Cup winner could hope. Yes, Barry Trotz was memory-holed after leaving to coach the post-Tavares Islanders. Good luck with that. Top assistant Todd Reirden was promoted to take his place, and the Capitals look little troubled by Trotz’s absence given the stability and talent throughout the rest of the roster. Early indications are that Reirden has no desire to reinvent the wheel on the Caps’ up-tempo attacking scheme. And why would he? Ovechkin is Ovechkin. Nicklas Backstrom’s output looks to be in a gentle decline but is more than compensated for by the emergence of Evgeny Kuznetsov as one of the league’s most dynamic scorers, and T.J. Oshie’s unexpected transition to a poor man’s Phil Kessel. Tom Wilson’s 20-game suspension will be a distant memory by the playoffs, unless he gets himself suspended again—which seems like a thing Tom Wilson would do. Dmitry Orlov manages to remain completely anonymous despite becoming one of the league’s better d-men. Would you believe that Capitals generated more shots last season with Orlov on the ice than with John Carlson, and in less game time? The Caps return all six defensemen from their Cup run, and their top four blueliners are all locked up for at least three more years. Even Brooks Orpik, traded then bought out, is back. Carlson re-upped at $8 million per season for eight years—too long, but necessary to secure the services of a free agent Norris-caliber defender and core player on a team with a finite Cup window. Losing Carlson would have forced radical moves. Instead, the roster is as close to unchanged as any Cup winner in recent memory. One potential area of concern is who’s backing up Braden Holtby, since budding starter Philipp Grubauer was traded and replaced by career AHLer Pheonix (sic, and also what the hell?) Copley. One team that figured to make a strong push for Carlson in free agency was Vegas. Their fairy-tale inaugural season had three components: an incredible expansion draft, Marc-Andre Fleury having a career year, and a no-name defense that inexplicably but continually got the job done. In the finals, Washington exposed that defense for what it was (and is): a bunch of castoffs who got bailed out a lot by Fleury and who benefitted from the high-speed Vegas forwards keeping them off their heels. That’s why it’s hard to understand what Vegas was trying to do this offseason. The team exploited tremendous speed to cover for a shaky defense last year, but added two expensive, aging, and not exactly speedy forwards—Max Pacioretty and Paul Stastny—to a top-heavy roster while returning the same six defensemen. Since hitting it out of the park in the expansion draft —avoiding bad contracts, and focusing on young players with speed, and unflashy but productive veteran scorers—George McPhee’s moves as GM have left him wide open for second-guessing. At last season’s trade deadline he sent first-, second-, and third- round picks to Detroit for Tomas Tatar – an overpayment for an underwhelming player whose skills duplicated those of guys already on the roster. Tatar was a frequent healthy scratch in the playoffs added nothing when he did play. The trade was overlooked because Vegas kept winning, and because it had stockpiled a ton of picks, but it’s another in a long list of sharts by McPhee. This is still the guy who turned Filip Forsberg into Martin Erat. Tatar was so bad, McPhee had to throw in a top prospect and a second-round pick to spin him off to Montreal in a trade for disgruntled winger Max Pacioretty. Vegas quickly signed Pacioretty to a four-year extension that doesn’t kick in until next year, for the privilege of paying Pacioretty $7 million a year until he’s 34 years old. It’s hard to imagine throwing that kind of cash at the defense—the AAV is close to what Carlson signed for, remember—wouldn’t have done more for this roster than the classic “guy who isn’t gonna age well” physical forward. The other big signing, three years and $19.5 million for Paul Stastny, is hard to criticize. But it’s off to a rough start. Stastny is already on IR for at least two months, and the 32-year-old has earned a reputation as something of a contract-year phenom. McPhee was wise not to throw money at either James Neal (five years from Calgary) or David Perron (four years from St. Louis), but why replace them with other older, expensive guys? Plausibly McPhee sees last year’s trip to the Finals as a sign that the window is open, and that window never stays open long. But there is a much more glaring weakness that went mostly unaddressed. The Knights’ top defensive pairing is probably Nate Schmidt (currently suspended) and Shea Theodore. Every team has bottom-pairing guys, but Vegas has five or six of them. If McPhee is in win-now mode, it’s difficult to understand why he didn’t offer Carlson the moon, or outbid San Jose in the Erik Karlsson sweepstakes, or even try for lesser but solid free agents like Ian Cole or Calvin De Haan. The best McPhee could manage in free agency was Nick Holden, who watched most of the playoffs from the press box for the Bruins last year. Fleury and Malcolm Subban better be ready to stand on their heads again. McPhee’s curious offseason aside, there remains a ton to like about this team. The top line returned intact. The speed guys are still fast (Alex Tuch’s return from IR will help). Stastny is a very good all-around hockey player when healthy and motivated. But it’s hard to look at this roster without seeing question marks. Can they get away with that back end again? They’re off to good starts, but will top scorers William Karlsson and Jonathan Marchessault regress? How many games will Pacioretty play before a leg falls off? Washington, on the other hand, is virtually a lock to make noise in the playoffs. Toronto, Tampa Bay, and of course Pittsburgh are coming for them, but of those, you can really only say the Leafs got markedly better. The future is murkier for Vegas. Falling behind early in the Western Conference isn’t a great idea, not if you want to avoid powers like Winnipeg and Nashville in the playoff’s early rounds—if you even make it—and if McPhee has to scramble to fix his D at the trade deadline, it could be ugly. “Two first round picks for the next six years of Brent Seabrook’s contract” ugly. The Vegas front office looked like geniuses last year, but that honeymoon only lasts as long as a winning record does.